Research says that counting is the number one way to develop number sense. Counting collections is a informative activity that gets students counting and gives us a window into their needs and strengths, but it can make some teachers crazy. Thirteen things you need to know when counting collections. 1.) No time to make collections? – Have the kids do it. Ask the students to fill the bags with different amounts of objects. You can use them in your own classroom to count later or trade with another classroom. 2.) Wondering what to put in the collection? Almost anything you already have in your cabinets. I try to stay away from things with pointy parts. I love including shapes and coins because it can lead to sorting, describing attributes, and developing academic vocabulary. *Fifth graders often intuitively divide decimals when counting and sorting coins. Please refer to your classroom cabinets before you spend a single dime. 3.) How many objects should be in the bag? I have leveled collections (large, medium, and small) the amount in each changes throughout the year. A small bag in kindergarten may begin with 5 objects at the beginning of the year and evolve to 30 objects by the end of the year, while a large kindergarten collection may start with 10 and end with 100. Third graders may have a small bag that begins with 125 and ends with 500. Start small and continually add more objects to the different levels when your students are ready to be challenged. You will know they need to be challenged when they are regularly done counting and recording accurately within the allotted time. Check out the labels at www.TeachingOneMoore.org store to help you stay organized. 4.) Things falling out of bags? Many teachers spend hours preparing their counting collections. They make bags filled with 10, 30, 50, 100, and 1,000 objects and then find random pieces all over the floor and freak out because their bags do not have the right amount. Don’t worry if a bag is off by a few objects. It’s not about students counting exactly 100 objects. It’s more about how they count the 100 objects. Do they count by 1’s, 5’s, 10’s, etc.? Are they organized when they count? Are they getting stuck at a certain number? Are they working within a range that helps them move past benchmarks? These are the important questions to keep in mind when students are counting. 5.) Kids are “playing” with the objects. I have seen students scoop up handfuls of objects only to let them fall between their fingers again. I have seen students flick objects off of desks, throw them at others, or just toss them around. These actions usually indicate to me that the students are experiencing sensory overload. The collection they are counting might be too big for them right now. In these situations, I take away some of the objects and observe them to see if they can this lesser amount. Surprisingly, this usually solves the problem. When dealing with kids “playing” with objects I want to assess the reason(s) why. I start by giving them the benefit of the doubt rather than getting frustrated with their behavior. However, no matter how much you plan, there is almost always a kid who insists upon using the tools the wrong way. This is to be expected. I let all students know before counting what the expectations are; if a student chooses to use the tools inappropriately, I give them pieces of paper with pictures on them that they can count and keep track of with a pencil. They don’t particularly care for this option and usually opt for counting the objects correctly. 6.) Kids are having trouble writing and identifying numbers. Place number charts in the counting collections bins (see photo above). I use enlarged number charts in kindergarten and first grade, and beyond if necessary. 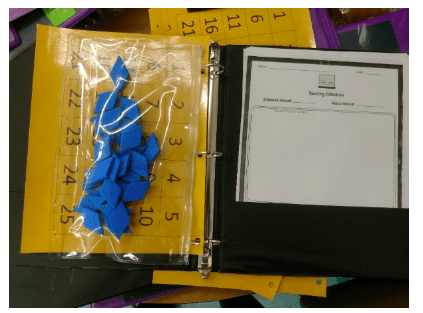 Students can place their objects on top of the grid to help with one to one correspondence, left right return sweep, number tracking and recognition. 7.) Get kids to record their work. Some students are so consumed with the action of counting, they do not have the cognitive space or time to record as well. Provide all students with paper to record and when they are ready or the time is right, prompt them to record how they counted. If students are working with a partner, one partner can record while the other partner counts. Unfortunately, some kids are reluctant to record how they counted. If there is no record of their counting, how do we know they counted? Set recording as an expectation for those students who are capable. 8.) What if my students are not finished counting? This is where it can get messy. If students are not able to finish counting their collections in a day, record the amount counted so far, place it in cups, bags, or lunch trays. Place the remaining uncounted objects in a separate bag. Scoot the collections over to the side of the room, place them on shelves, or anywhere you can find space. The kids I have worked with have all been pretty respectful of other peoples collections. Teachers do have to be able to handle the chaos, it’s unavoidable. Sorry. 9.) Need counting collections homework? Send home pages filled with rows of pictures and ask students to count the objects on the page. Notice how they count, by 1’s, 5’s 10’s. Encourage them to use rounding or “friendly” numbers. When they see a row of 9 do they round to 10 and subtract the difference i.e., (10 x 10) – 10? When they see rows of 3 do they round to 2 and add the difference i.e., (9 x 2) + 9? Do they cross off objects as they count to keep track? Do they skip count, circle, and label groups as they go? 10). Students keep making mistakes as they count. Counting collections is the perfect opportunity to teach students the definition of array and disarray. Draw a small amount of objects in an array on the board, label it “Option A”. Then draw a small amount of objects in disarray on the board (literally make a mess), label it “Option B”. Then ask your students which one is easier to count and why. While they are counting collections ask them if they will use Option A or B to show how they counted. Some students may need some in the moment coaching afterwards i.e., “Look at your collection. Is it an array or disarray?” They tend to get the picture. Additionally, students who are challenged with one-to-one correspondence can benefit from using ice cube trays or egg cartons when they count. 11.) Do kids have to count together? Some kids like to count together, some kids don’t. Choose your battles. There are many benefits to partnering students up. Partners can make counting a large amount more time effective. Students who struggle with number recognition can benefit from working with a student who easily recognizes numbers. One student can move the object, while the other student says the number and vice versa. Some students are on the verge of counting groups of objects and can benefit from working with a student who is already there. Partner counting also provides an opportunity for students to practice using academic language. English learners and those with limited academic language can use all of the authentic practice they can get. Big kids gotta count, too! Older students have memorized many rules and will often repeat them back to you on command, but when given a situation where they must apply the rule, that’s where the cracks start to show. 12. ) Make sure counting collections is relevant. If counting collections has been going well in your class and suddenly there’s a rebellion i.e. objects being thrown, then it’s time to put counting collections aside for a little while. Teachers typically start the year off with counting collections, work on them for 2 – 3 weeks, then begin implementing problem solving, where students get to apply their number sense. Some teachers bring them out in between new units for a few days. Yes, counting collections can serve as the entire math instruction block. There are hundreds of standards that can be learned through counting collections. Big kids need big numbers. They also need to see the connections to the operations and mathematical properties i.e., 3 (10 x 10) is the same as (3 flat trays filled with 10 cups, with 10 beans in each cup) and 470 / 10 = 47 (470 blocks, 10 blocks in each row/line, is 47 rows/lines). 13.) Get kids to count more efficiently. First of all as much as I am eager to get students to count more efficiently ( by 2’s, 5’s, 10’s) be careful about encouraging students to do so too soon. On too many occasions I have encouraged students to count by tens to 100 only to find out they had no idea how to count by ones to 100 (don’t assume this is a K-2 issue, I have seen it happen in fourth grade). It is pretty much my rule of thumb that I do not encourage counting by tens until I have observed them counting by ones to 100, (there are always exceptions to the rule, ). Ask your students, “What are some ways we know how to count?” Once they give a list of options, ask them to try and count in these ways while counting collections, then watch what they do.